Eat. Live. Laugh. and sometimes shop! : Seven?!? 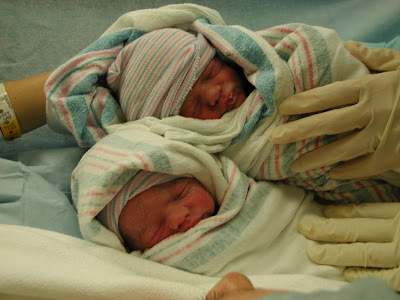 It was seven years ago that my darling twins were born into this world. Time stood still in that operating room. Literally stood still. At least that’s how I’ll remember it. This is what I saw. Life has not been the same for a single moment since. It’s been better by far. The sky is bluer. The leaves are greener. The air is fresher. Every facet of life is more vivid and intense. Of course, I can say that now. Those first few months . . . or rather, years, were a little hairy with twins. I’m not certain I was even able to breathe the air for a good four months. But that is all a distant memory now. More recent memories have invaded the part of my brain harboring any negative feelings. Their first steps. First words. Riding a bike. The first day of Kindergarten – kids were fine, mommy cried. And oh, so many unimportant, but incredible moments in between. Life truly is not about the milestones, but the moments. I have tried to live in those moments. To embrace each day and make it special. Will they ever notice or remember? Maybe, maybe not. It doesn’t really matter. I notice. I will remember. Forever. I think I remember receiving an email announcement with a photo of these two darling babies a little over seven years ago. So precious! And how time flies! Time flies much too fast! Wow they are so so tiny - twin is such a wonderful gift! My twins are 17 and in the thick of college applications and their senior year of high school. Enjoy every phase. My sisters told me to "pay attention" - it goes fast!